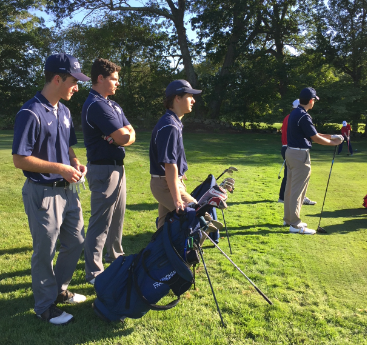 FRAMINGHAM – The Framingham High golf team hosted Natick High Tuesday afternoon at Framingham Country Club. The Flyers lost to their rivals 75-69. Framingham is now 2-6, under head coach Will Cook. Junior Luca Ferrari and sophomore Jack Corsi had the best scores for Framingham, both shooting 43 on the par 36, said Cook. Framingham Junior Jake Handy and sophomore Stephen Anes both shot 44, on the course. The Flyers will travel to The Country Club on Thursday for a match against the Warriors of Brookline High. Pictured are seniors Ryan Simeone, Andrew Smith, Kevin Lenzi, and Jack Freedman on the 1st tee waiting to begin their last high school match at Framingham Country Club.